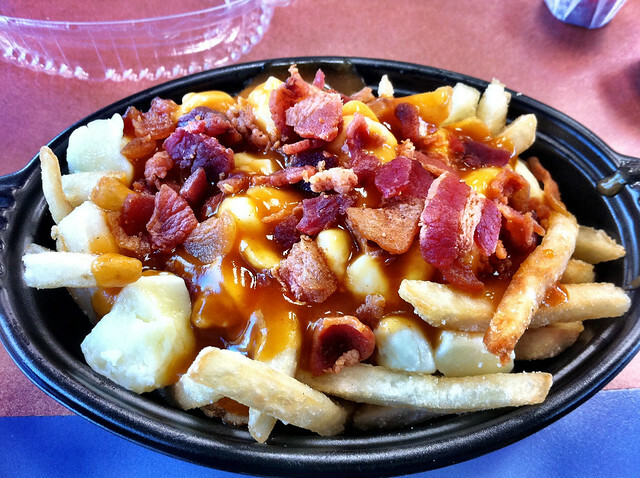 Not to be confused with Animal Fries, Poutine is a Canadian dish that’s oozing with lovely lardy goodness. And by that, I mean perfectly fried French Fries laden with brown gravy and topped with cheese curds. It’s enough to make you want to book a flight to Canada right now. 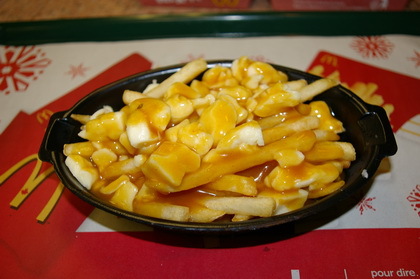 Other international fast food joints (such as McDonald’s, KFC, and Burger King) have tried to recreate this Canadian comfort dish. If you’re thinking, “Damn son, that looks good.” Wait until you hear (and taste!) our version. And nope, it does not include bacon. The French Fries were the easy part. With the cheese curds, we had to be a little more creative so we took a regular Yum with Cheese, tore it up, tossed it into the fries instead. Lastly, we drizzled some glorious Chickenjoy Gravy over the whole thing. Oh, and the best part? We didn’t waste the chicken that came with the gravy at all. We added some of that sinful Chickenjoy SKIN to our poutine because, why the hell not? Do you see how magical our creation is now? Can you think of any other localized version of poutine that’s possibly better than this? We didn’t think so. Peel the skin off the Chickenjoy, and chop. Set aside. Take the burger patty of the Yum with Cheese, and delicately remove the cheese from the bun (it usually tends to stick). Chop and set aside. In a bowl, spread the fries at the bottom. Sprinkle with chopped-up burger and cheese. When ordering the Chickenjoy, ask for the thigh parts because they have the most skin. I love you guys. I want to bear your children. But then again, where would it go out? Robert Charlebois’s “Je reviendrai à Montréal” just played in my head right now. Mikka, you are torturing me. needs more gravy! Gravy refill, please! hehehe i have the same reaction to the new champ burger rice with the fries under the patty…. sounds disgustingly good. You two are geniuses. I’m heading over to Queens, which unfortunately is the only place in NYC you can get Jollibee, right now to try this. There’s a Jolibee in Queens!? Nice! Oh my! Never thought about this.. Genius! For a Filipina living in the French- Canadian part of Canada (or as the locals call it Acadian region), Jollibee poutine is match made in heaven. It’s like being in two places at once! Well it’s not really an idea if it was already invented years ago by French-Canadians, but it still looks pretty damn good!! How can something be so wrong and be so right at the same time.